We were at Kansai International Airport yesterday, seeing Fumie's mom off on a trip to Hawaii (finally taking a trip with some friends, first planned 10 years ago!). Afterwards we went up to the airport-view restaurant to have a drink and some snacks (Anthony got to have a $5 orange juice! 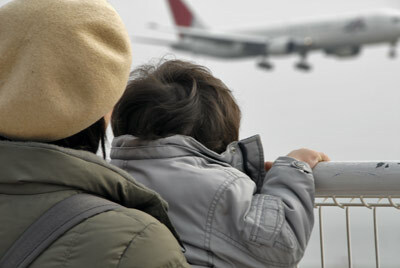 ), and watch the planes take off. It was late and Anthony was tired, but he behaved himself wonderfully, and as we were paying the bill, the waiter grabbed a big handful of candy and gave it to Anthony. On the surface this was a kind gesture. Certainly, kids love candy, and he wanted to make Anthony happy, and that's a wonderful sentiment that any parent appreciates. But it's also a dangerous thing, because while it's fine if the child can have what's given, it only creates pain and trouble if the child is not allowed to have what's given (say, due to allergies or diabetes.... or because his parents generally don't give him candy and don't want to start now). Anthony has a lifetime of junk food ahead of him, so at three years old, we don't feel the need to pump him full of it now. At home he drinks milk, water, or barley (non-caffeinated) tea, and he's quite happy with it. He doesn't know he's missing junk-food drinks like soda and “fruit-flavored juicy drinks”. When we go out to a restaurant, he's allowed to have juice (orange, apple, etc.). We almost never give chips or sweets or chocolates or any host of junk foods. He doesn't feel deprived at all, because he doesn't know what he's missing. He loves raisins and dried blueberries and cherry tomatoes and strawberries as snacks. Occasionally, we'll have cake or something, but he knows that these are during special times, and that makes them all the more special. Anyway, if you are ever in the situation like the waiter and want to give a kid a treat, ask the parents first. And do so out of earshot (or with a linguistic level beyond the understanding of the kid), or it's the same as just giving it (because it makes just as much trouble saying “no” when asked as when given). I've found myself a number of times having some snack or other with Anthony (aforementioned fruits, etc.) and had a two- or three-year-old kid look with those I-really-want-some-too eyes. I ask the parents, and normally it's fine that I go ahead and share with the kid, but there have been times when they've said no (one was allergies, and one I don't know), so I just finished up quickly and put it away. A woman came to a party I was at once with her toddler. He went for some gummy beans I was offering in a dish. She said, “No no! We don’t eat jellybeans, they might be made from animal products and we are vegitarians.” Three seconds later, she grabbed a handfull for herself and I stifled a laugh.